Evan K. Shaw of American Pottery created this sweet figurine of the shy and timid skunk, Flower, from the highly popular 1942 Walt Disney film, Bambi. Adorable blue eyes with long, long eyelashes gaze upwards and to the side. A little pink nose, a hint of rosy pink ears peeking out of lush white and black fur, and a friendly, smiling mouth complete the image of a woodland creature that exhibits an innocence shared by the delightful characters in Bambi. Many different sizes and versions of Flower were produced by a variety of potteries. This one is considered to be a medium size, standing 3 1/4" tall. Flower is in excellent condition, with no chips, cracks, crazing, or repairs of any kind. As you can well imagine, Flower's nose is particularly prone to chipping, and this one is beautifully preserved. Bambi and his friend Thumper meet a shy young skunk in the 1942 Walt Disney film, Bambi. They are exploring as Bambi sees the skunk sleeping in a bed of flowers. Bambi is just learning to talk and calls the skunk a pretty flower. 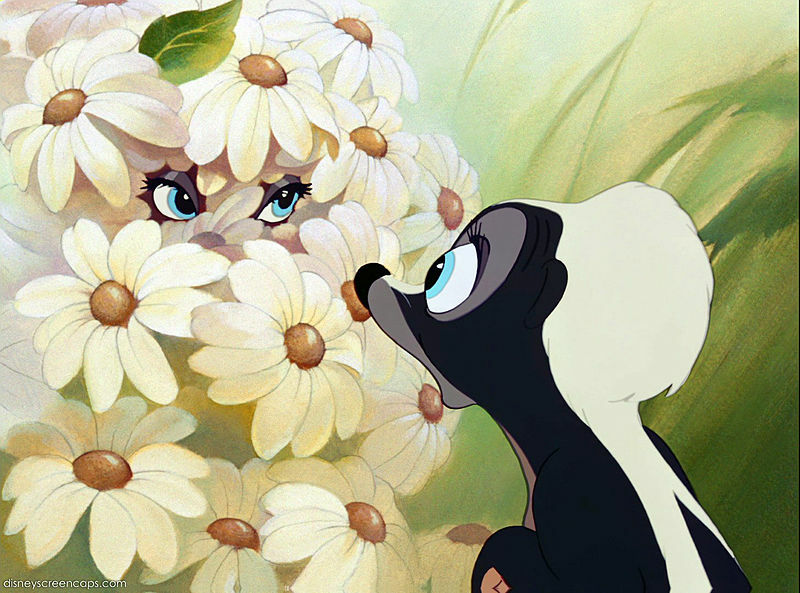 Thumper tries to correct Bambi, but the skunk says he doesn't mind being called Flower. Flower, Thumper, and Bambi become close friends, but in the film Flower is not seen much when he goes to hibernate. Flower is seen later in the film as a young adult. Flower falls in love with a skunk named Bluebelle, and they have a son named after Flower's dear friend Bambi. In the early days of Disneyland's history, Flower was one of the many characters that would pose for photographs with delighted children and their families. Most often, Flower would be accompanied by his friend, Thumper, during the popular Easter season at Disneyland. Flower has since retired from that job, however.